I was glad to tell the Carthusians that I was going on from there to the Church of St Mary Magdalen in Brighton to be subdeacon at the Mass celebrated by Fr Ray Blake for his 25th anniversary of ordination, and that he had chosen to celebrate Mass in honour of the Carthusian martyrs. The picture above is from the Chapter House at Parkminster; a post of mine from August 2006 has a few more. The novice master tells me that the pictures have been cleaned so one of these days, I must take my camera down. The drive from Parkminster to Brighton was fairly easy and I was glad to be reasonably early and meet the other priests who came along. Fr Sean Finnegan (of Valle Adurni) was Deacon and preached an excellent sermon. 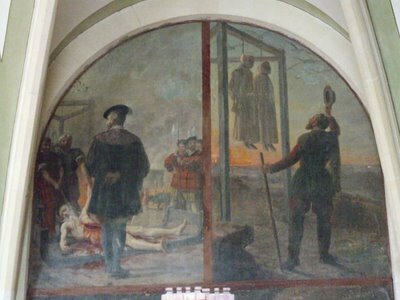 He focussed particularly on the martyrdom of St John Houghton, Prior of the London Charterhouse, who was cut down from the scaffold while still alive and had his body ripped open. Henry VIII had insisted that the Carthusians were to be executed in their habits and St John still had his hair shirt on, which proved a problem for the executioners trying to hack through it. His heart was torn out while he was still alive and St John said "Sweet Jesus! What will you do with my heart?" Fr Sean admitted that this exclamation was not easy to interpret. He suggested that it was a prayer always in the mind of St John Houghton and finally answered with the glorious crown of a courageous martyr's final triumph. It is also a prayer that we can all make, and recommend especially to the young searching for their vocation. 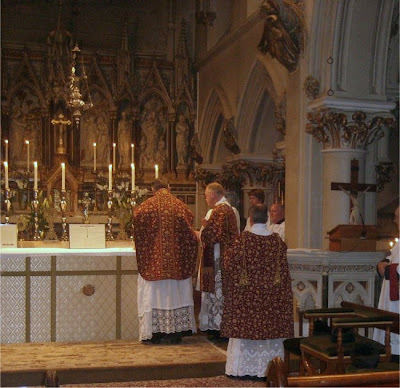 The Mass was sublime, bringing to mind Fr Faber's words characterising the solemn High Mass as "the most beautiful thing this side of heaven." Two choirs sang - one doing the Gregorian Chant and another singing Victoria's Mass "O Quam Gloriosum." I felt I made a reasonable job of being subdeacon; I'm getting more familiar all the time with High Mass and ironing out mistakes and panicky looks towards the MC. Today's MC, Dominic Scarborough, was very competent but my own MC from Blackfen was in the congregation making mental notes to help me in the virtue of humility. The vestments belong to the Cathedral Church of the Diocese of Arundel and Brighton. They are difficult to photograph well. I have taken one of Fr Ray's photos, cropped it, removed the colour cast, and bumped up the contrast a little - the result is a reasonable showing on my monitor. Canon Tim Madeley, who assisted in choir, was on hand to ensure that the vestments were returned safely! All in all, a wonderful evening to celebrate an ordination jubilee of a friend and fellow priest. I was impressed that so many local came. I expect that several were not by any means "traditionalist" or particularly keen on the usus antiquior but came just to celebrate with one of their brothers.